The Progress 52 spacecraft approaches the International Space Station for docking on July 27, 2013. An unmanned Russian spacecraft arrived at the International Space Station Saturday (July 27) bearing food, supplies and a repair kit for a malfunctioning spacesuit on the orbiting outpost. 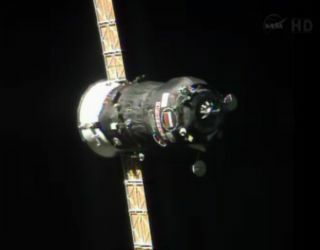 The robotic Progress 52 spacecraft docked at the space station's Earth-facing Pirs port at 10:26 p.m. EDT (0226 July 28 GMT), after launching from Kazakhstan's Baikonur Cosmodrome less than six hours earlier. The vehicle lifted off on a Russian Soyuz rocket at 4:45 p.m. EST (2045 GMT). The cargo ship is loaded with nearly 3 tons (2.7 tonnes) of food, fuel, hardware and science experiment equipment for the six-person crew of the station's Expedition 36 mission. Among its cargo is a set of tools intended to help the astronauts investigate and patch up the spacesuit that malfunctioned during a July 16 spacewalk outside the orbiting laboratory. A Russian Soyuz rocket launched on July 27, 2013 carrying the unmanned Progress 52 resupply vehicle for the International Space Station. "The investigation is ongoing, troubleshooting is ongoing to try to isolate the exact cause of the water intrusion into Luca Parmitano's helmet," NASA spokesman Rob Navias said during launch coverage on NASA TV today. Progress 52's express trip will bring it to the space in station in just six hours, docking after only four orbits of the planet — a shorter journey that's been adopted recently to save vehicles time on a trip that used to take multiple days. The next space station resupply delivery craft — the H-II Transfer Vehicle-4 from the Japan Aerospace Exploration Agency — is scheduled to lift off on Aug. 3 from Japan's Tanegashima Space Center. It will ferry 3.6 tons (3.2 tonnes) of dry cargo, water, experiments and spare parts to the orbiting laboratory, according to NASA. The astronauts currently there include NASA's Karen Nyberg and Chris Cassidy; the European Space Agency's Luca Parmitano; and Russian's Fyodor Yurchikhin, Pavel Vinogradov and Alexander Misurkin. This story was updated at 10: 26 p.m. EDT.